Perhaps what made the summer of 1967 so magical, were all the changes I was going through at the time. For the young, the world was at the very precipice of discovery. At twelve years old, I could begin to imagine myself with the freedom of an adult, driving a car, going camping and fishing whenever I felt like, re-defining rules of dinner and bedtimes, and pretty much living the life of ease and luxury that comes with the freedom of choice. Of course, Summer always provides the fuse for such whimsy, and vividly colored daydreams become pleasingly affordable. The cars that our parents drove were beginning to be handed down to older siblings, who in turn, fixed them up to suit their own tastes. The beautiful "muscle cars" of the era were stunning revelations of what was to come. It was great fun to see them barreling down the street. Everything was so alive in summer, and the 60's, though just a memory now, still live with me today. On hot days we drank pop from an ice cold ten-cents-a-bottle cooler, or our own refrigerator. Remember how great those dripping wet ice cold bottles felt when we pulled them straight from the cooler? It seems to me that the most important service service stations provided was to have a pop machine or cooler on hand. The first swig of cola, strawberry, grape, orange, root beer, or whichever was a carbonated blast to the throat, but tasted so delicious. Before the fizz could settle, all I wanted was another. Outside, beyond the veldt of dry grass and shady trees, the heat was like an oven. Summer was alive and kicking. The stinging scent of fresh greenery, wet lawns, hot asphalt, or the penny candy inside the corner store was always a precious aroma. Most of us guys went shirtless, wearing only cutoffs. I used to wear these rubber thongs that flip-flapped my feet whenever I walked. They felt good as protection against the scorching asphalt and sidewalks. I remember hosing them down just to cool them off before slipping them on. Cars would drive by, the sun was out, the skies were blue, and everything was brilliantly animated. The walks to the corner store were usually fairly long, and seemed farther in high temperatures. Life was just so darned easy then; the most traffic on the side streets were the occassional passing cars, and the sounds of summer were usually provided by distant lawnmowers, birds, and, once in a while, a passing plane overhead. Of course, the yelling of other kids playing was a constant, but that wasn't a bad sound at all. 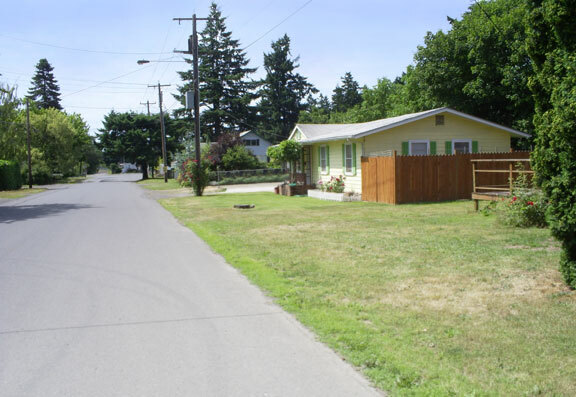 The image of the neighborhood street, and the yellow house to the left was one of the houses we lived in. So many great memories happened on this street, and in this area. Around the corner, and two blocks down was a big empty field with a stack of tires. This was the prime army-playing area, as the field was so large with lots of bushes and a few trees. 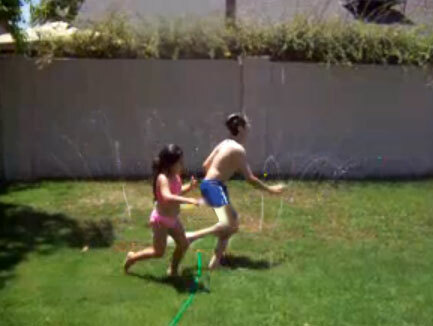 The cheapest fun we could have was running through the sprinker, or having water fights. I can recall several types of sprinklers; there were the spinning types, the oscillating, and even strips of flat sprinkler hose. Each did their job well, and we could get decently cooled off. Even the backyard kiddie play pools worked well for a quick dousing off. I remember skimming off handfuls of grass from the surface of the water that gathered from bare feet on the lawn. 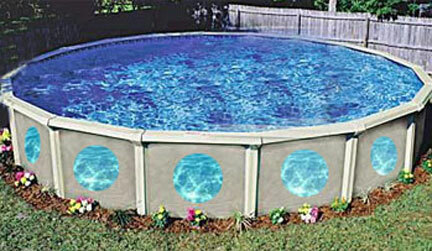 Pools were always so enticing with their blue plastic color magnified from beneath the shallow water. Summer evenings were a bit more free by this time. My brother and I were old enough to stay home alone while my parents went out for the evening. My brothers Mike and Aaron, were both in the Navy. My oldest brother Kenny was married, so that just left Pat and I. My dad would always give us five dollars apiece to blow on candy and pop, or whatever. I used to load up at the corner store on "Papa Size" Dad's Root Beer, a box of Cheese Nips, and whatever candy was necessary to get me through the night. The television shows that I liked were a bit limited for Friday and Saturday nights, but I do remember "Gomer Pyle, USMC". Often, the neighbor kids would come over, and we'd watch marathon reruns of Thriller and the Alfred Hitchcock Hour, then the great monster movies that came on later. It's amazing how long we could endure in front of the TV then. The music of 1967 was very exciting. Sophistication-as well as style-was beginning to dominate the pop music market. One of my favorite groups of the era was The Young Rascals and the songs "Groovin'" and "How Can I Be Sure" were solid favorites, and still are! Songs lingered on the radio for a long time then; movies stayed in the theaters for a long time as well. There was a sense of dependability then. The music was upbeat and exciting. The Mamas & The Papas were great, and we heard their music playing from home stereos all over the neighborhood. TV shows offered a lot of good stuff in 1967, but summer was the season of reruns. There were some new favorites that I recall, like The Mothers-in-Law, The High Chaparral, The Second Hundred Years, and He and She. The carry-over shows from earlier seasons were still my absolute favorites. Again, I was very big on Gomer Pyle USMC mostly due to the show's co-star Frank Sutton. I always loved Sgt. Carter, and his constant yelling. Yelling comic characters were my favorites. The Time Tunnel was for me, an amazing show, and I still like it to this day (even though now, the plots are hokey, but still great). The Invaders was a show after my own heart since I had a tremendous fascination with UFO's and flying saucers. I greatly admired, (and still do), the fact that they didn't go crazy with the design of the UFO, but rather made it look like so many photos from Project Bluebook Magazine. The magazine had a short shelf life, but I loved it, and bought every issue I could get my hands on. Westerns were still great, and heavily on my radar. The Guns of Will Sonnett "No brag, just fact" was interesting, but I lost interest after awhile. The Big Valley and The Virginian were still my favorite westerns, the latter because it was so long. I tried to like Cimmaron Strip but I couldn't get into that one either. TV channels were but a few in the 60's, so I often had to decide what I wanted to watch since networks offered great shows during the same time slot to compete with other networks. I chose Tarzan over Star Trek. Upon reflection, I see that I chose incorrectly, but I was a Tarzan fanatic.